World stock markets are closing out the week on a euphoric note, with Asian and European stocks and S&P futures roaring higher on Friday amid a sea of green on Friday on renewed hopes that the US and China were starting to repair their badly damaged trade relations. 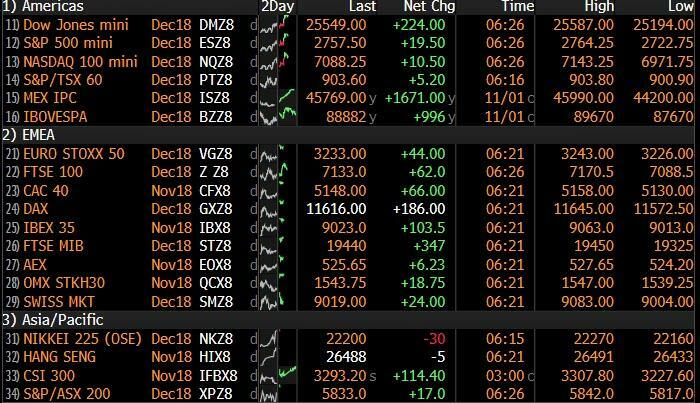 As shown in the table above, stocks extended gains around the world, as Treasuries dropped and the dollar tumbled on Friday on the back of fresh hopes for trade between the world’s two biggest economies. The buying frenzy was unleashed after Bloomberg News reported that Trump was interested in reaching an agreement on trade with Chinese President Xi Jinping at the Group of 20 nations summit in Argentina this month, and has asked key officials to begin drafting potential terms. The latest attempt at easing trade tensions (and boosting stocks, incidentally just 5 days before the midterm elections) came less than 24 hours after Trump tweeted that he held a "long and very good conversation" with China's President Xi, in which trade was the key topic and "discussions are moving along nicely." Europe was overjoyed too. 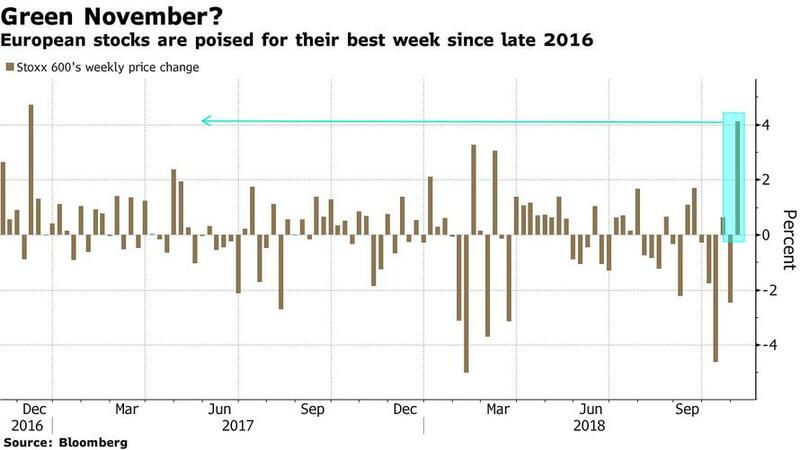 Germany's export-heavy DAX jumped 1.5% in its best start since July with Volkswagen +4.5%, pushing the DAX up to best levels this week, while European shares were headed for their best week since late 2016. The Stoxx Europe 600 was over 1% higher taking this week’s gain to 4.1 percent. Even the long-suffering auto and mining sectors edged higher. Luxury and chemicals got a boost, as did technology shares that might otherwise be fretting more over Apple’s disappointing sales forecast. European earnings have improved lately, though this quarter is still the weakest season in four years as margin pressures build, according to Morgan Stanley. Earnings revisions are at the lowest in 2 1/2 years, while share prices have reacted more strongly to result misses than they have to beats, the U.S. bank said. On the other hand, final Mfg PMIs from around Europe came in slightly on the softer side of prelims while Italian manufacturing shrank the most in nearly four years, but trade news trumped data this morning, however fleeting that may be. BTPs print fresh highs having been knocked on the data, Bund/BTP spread tightens to 289bp. Meanwhile, even the long-running Brexit drama saw a positive twist this week, with Brexit Secretary Dominic Raab saying he expects a deal by Nov. 21. That’s caused the FTSE 100 to underperform Europe for a third-straight day, as the pound continues to gain. Dow Jones and S&P futures were also up almost one percent ahead of the monthly non-farm payrolls jobs data, and even the Nasdaq was higher despite the drop in Apple shares pre-market trading after underwhelming sales forecasts. There was no hiding from today's euphoria: an index of emerging-market equities jumped the most since March 2016, while currencies from South Korea to Australia joined the rally. As risk aversion faded, the Bloomberg dollar index tumbled back below 1200 and commodity currencies rallied. Risk-sensitive currencies and stocks extended their recent rebound as the onshore yuan headed for biggest two-day gain since January. Sterling made ground again to $1.30 on hopes London is closing in on transitional deal for when it leaves the EU next year. If it doesn’t slip it will be the second best week of the year for the pound. Thursday was its best day of the year. “Were it not for Brexit uncertainty, the Bank of England would probably have laid the groundwork (at its meeting on Thursday) for its next rate hike,” BNP Paribas analysts said in a note. Overall, prospects for easing protectionist tensions are helping round out a week that’s seen appetite for risk assets return following the October rout in equities; the question of course is how much of what Trump has said is just an attempt to goose stocks into the midterms. "Either President Trump is paving the way for a trade deal being agreed at the Buenos Aires G-20 summit later this month, or he’s cynically driving up equity indices ahead of U.S. mid-terms,” said SocGen FX strategist Kit Juckes. “What’s for sure, is that talk of a trade deal has added further juice to the last few day’s risk appetite." "When Trump wants to bump the market ahead of the mid-terms the market likes it," Saxo Bank’s head of FX strategy John Hardy referring to next week’s mid-term U.S. elections. Hardy said while it might just be “political theater” from Trump for now, the real test would come when he and China’s President Xi Jinping meet at a summit of world leaders later this month in Argentina. Meanwhile, doubts remain on the capacity of earnings to deliver. Apple’s disappointing forecast for the key holiday period suggested weaker-than-expected demand for the company’s pricier new iPhones. Next up is the U.S. jobs report for October later Friday, while U.S. mid-term elections next week are also weighing on investors’ minds. As for the renewed euphoria of world trade peace, Bloomberg notes that talks between the U.S. and China may not be straightforward, with intellectual property theft still a stumbling block. A Chinese state-owned company was charged Thursday with conspiring to steal trade secrets from American chipmaker Micron Technology Inc. as the Justice Department steps up actions against the Asian nation in cases of suspected economic espionage. In rates, Europe’s bond yields rose already on the rise as economists expect a 200,000 rise in U.S. jobs and see hourly earnings increasing 3.1% Y/Y. US 10Y Treasury yields with 3bps higher, at 3.1627%. In commodity markets, metals led the charge on the hopes a trade deal will prevent China’s resource-hungry economy faltering. Three-month copper on the LME climbed as much as 2.5% to $6,240.50 a ton, its highest in a week. Other base metals were up across the board too, with zinc rising 1.8 percent, nickel climbing 1.7 percent, lead up 1.3 percent and aluminum gaining 0.9 percent. Meanwhile, WTI was steady as fears over a supply disruption eased after the U.S. was said to agree on giving waivers to eight nations to continue importing Iranian crude. Bloomberg’s gauge of industrial metals extended a rebound from a 15-month low as copper, zinc and nickel led gains in other raw materials. Riksbank’s Ingves: matters little whether hike in Dec. or Feb.
Asian equity markets tracked their Wall St counterparts higher after US stocks posted a 3rd consecutive gain with sentiment underpinned by optimism regarding US-China trade after what US President Trump described as a ‘very good’ conversation between him and Chinese President Xi Jinping. Furthermore, reports that Trump asked the cabinet to draft a potential China trade deal added fuel to the rally and helped US equity futures recover from the after-market pressure triggered by declines in Apple shares after the tech giant missed on iPhone and iPad sales, provided soft Q1 revenue guidance and announced to halt product unit sales data. ASX 200 (+0.1%) and Nikkei 225 (+2.6%) were mixed throughout most the session with Australia dampened by energy names after WTI crude futures slipped 2.7% to below USD 64.00/bbl on higher OPEC production in October, while the Japanese benchmark surged on a weaker currency and the encouraging trade related news. Elsewhere, Hang Seng (+4.2%) and Shanghai Comp. (+2.7%) also rose aggressively on the positive developments between US and China, with gains led by strength in tech names as well as casino stocks post-Macau gaming revenue numbers. Finally, 10yr JGBs were eventually flat as the initial upside was wiped out as US-China trade hopes were kindled by overnight reports, while the BoJ were also in the market today and increased its purchase amounts in the 1-5yr JGBs which was unsurprising given the reduction in the number of occasions it had planned for those purchases this month. Main European indices are in the green, continuing the trend from Asia. The FSTE MIB (+1.5%) is leading after reports in Il Sole that Banca Carige are the only Italian bank seen as fragile; while the SMI is lagging (+0.1%) after the US FDA announced that Roche’s (-1.5%) recall is Class 1. Indices are mixed with materials (+2.3%) outperforming due to trade progression between the US and China, notably President Trump said to have asked his cabinet to draft a potential trade deal. In terms of individual equities Kering (+5%) are higher after being upgraded at RBC, which has had a knock-on impact on other luxury names such as Burberry (4.5%), Moncler (+5.5%) and LVMH (+3.8%) who are up in sympathy. Separately, BMW (+2.5%) are up as they state they are expanding their car share service into 5 more London boroughs. In currencies, there was no respite for the Dollar, as its retracement from midweek peaks continues, albeit at a more measured pace. The latest downturn comes amidst reports that US President Trump has commissioned a draft trade accord with China following his encouraging chat with Xi and plans for a dinner+ date between the 2 at the upcoming G20 summit in Argentina. The Greenback is weaker vs all G10 counterparts, bar the JPY, which is still bucking the trend as an even safer currency haven, although the headline pair has topped out just above 113.00+ again and is back below its 30 DMA at 112.85, which could be pivotal on a closing basis. On that note, the DXY looks precarious just a fraction ahead of 96.000 in advance of NFP that could determine whether the index stabilises, recoils further or rebounds. AUD - The major outperformer and main beneficiary of constructive dialogue between China and the US, with Aud/Usd extending its marked recovery to 0.7250 before fading and essentially tracking Yuan moves after a considerably lower Usd/Cny fix overnight. EUR/CHF/NZD/GBP/CAD - All firmer vs the Buck, with the single currency not deterred by some downbeat Eurozone manufacturing PMIs and breaching a key Fib at 1.1426 to expose 1.1450 before 1.1460. However, a cluster of hefty option expiries, and 3.1 bn at the 1.1400 strike may stall Eur/Usd, ahead of 1.6 bn between 1.1450-60. The Franc is back above parity, and perhaps belatedly taking some note of SNB commentary yesterday about the inevitability of tighter policy, while the Kiwi continues to piggy-back its Antipodean peer with gains up towards 0.6700 before waning. Elsewhere, Cable has sustained 1.3000+ status after a knee-jerk visit post-BoE super Thursday, and cleared its 10 DMA circa 1.3005-10 with the aid of more positive-sounding Brexit reports (on paper), but respecting the 100 DMA from 1.3045-50. The Loonie is holding near the upper end of 1.3050-1.3100 parameters and also has jobs data looming to provide some independent direction. EM - Broad gains vs the Usd, with the Try through 5.5000 and Cnh breaking 6.9000, but Rub lagging against the backdrop of still soggy oil prices. In commodities, WTI (-0.1%) and Brent (+0.3%) began the session lower following increased oil supply from Russia, OPEC and the US for October, notably the highest OPEC level since December 2016; an increase which has thrust the oil market into an oversupply dragging down prices. However, this has since reverted as Iran’s Deputy Oil Minister commented that he is unsure if waivers are permanent; comments which follow reports that 8 countries have received waivers allowing them to continue to purchase Iranian oil. Gold (+0.1%) is continuing the steady trade seen in Asia overnight, although off of yesterday’s highs of USD 1237.39/oz as market sentiment improves following Presidents Trump and Xi expressing optimism over the trade dispute. Separately, Trump has initiated an executive order preventing anyone within the US from dealing with anyone associated with gold sales from Venezuela. US is to give 8 countries waivers on new Iran oil sanctions, according to sources; updates to follow on the breakdown but India and South Korea have been touted as two of the nations. Looking ahead to today, the highlight is almost certain to be the October employment report in the US this afternoon however prior to that this morning we’ll get the final manufacturing PMI revisions in Europe including those for the Euro Area, France and Germany, as well as a first look at the data for the periphery. Also out this morning is the September import price index reading in Germany, while in the US we’ll also get the September trade balance, September factory orders and final September durable and capital goods orders data. Away from that, the BoE’s Tenreyro is due to take part on the panel of an IMF conference while the big earnings releases include Berkshire Hathaway, Alibaba, Exxon Mobil, Chevron and AbbVie. Early in the session yesterday it had looked like US equity markets might have had their legs taken away from them after this week’s rally. This followed a softer than expected ISM reading (more below) but a more upbeat comment from President Trump on Twitter about potential upcoming trade talks with China seemed to kick start a steadily climbing market for most of the rest of day. The S&P 500 rallied +1.06% which means it is now up +3.75% in the last three sessions. So it’s recouped about a third of the loss the index took into October 29th from the end of September. That three-day gain is the biggest since immediately following the US elections in November 2016 now for the S&P. The DOW (+1.06% yesterday) has also had its strongest three-day run since November 2016 while the NASDAQ (+1.75% yesterday) and NYSE FANG index (+2.56% yesterday) have had the strongest runs since June and February 2016 respectively. Apple earnings poured a bit of cold water on things after the bell though. Earnings per share and revenue both beat the consensus forecasts at $2.91 versus $2.78 and $62.9bn versus $61.4bn, but the company’s guidance was disappointing. In addition, Apple sold fewer iPads, Macs, and iPhones than expected, and the stock traded around -6% lower in after hours trading. In Asia S&P futures were initially down around 0.5% on the back of Apple but more positive China/US trade headlines have reversed this as we type. They are now up 0.6%. Looking at the trade headlines chronologically, the tweet from President Trump which helped markets to bounce in the morning US session was a vote of confidence from the President that conversations with Chinese President Xi Jingping on trade and also North Korea ahead of the G20 meeting later this month are “moving along nicely." Reuters followed with a headline quoting Xi as saying that the President hopes China and the US can promote a steady and healthy relationship. The reporting by Chinese state-run television was similarly rosy, saying that Trump "cherishes the good relationship with the Chinse president" and that Xi "wishes to keep the Sino-US relationship healthy and stable." Overnight, following yesterday’s call between the US President Trump and China’s President Xi Jinping, Trump has asked his key cabinet secretaries to have their staff draw up a potential deal to signal a ceasefire in an escalating trade conflict. This was reported by Bloomberg citing unidentified sources. In the meantime, China’s daily South China Morning Post reported, quoting unidentified sources, that Mr Trump has offered to host a dinner for Chinese President Xi Jinping on December 1 in Buenos Aires after the G20 leaders summit, an invitation China has tentatively accepted. The possible thaw in the trade war has helped risk gain momentum in Asia this morning. The Nikkei (+2.36%), Hang Seng (+3.58%), Shanghai Comp (+2.14%) and Kospi (+3.46%) are all up along with most Asian markets. Asia FX is largely up on the pause in trade war escalations with export oriented countries leading the gains - the Taiwan dollar (+0.85%), South Korean Won (+1.43%), China’s onshore yuan (+0.23%) and Australian dollar (+0.51%) are all up. In spite of the rebound this week, October won’t be forgotten in a hurry, given the extent of the sell-off across markets. This is a good time to remind readers that we published our usual monthly performance review yesterday for October as a supplement to the usual EMR. You can find the link here .In it, we show an interesting chart that highlights how 2018 is shaping up to be the worst year on record in terms of breadth of negative assets returns in dollar terms, with data going back to 1901. In our sample, 89% of assets have now seen negative total returns in dollar terms this year. That is after 2017 saw the ‘best’ performance on this measure with just 1% (or 1 asset) with a negative dollar return. Hardly a coincidence in our view that this occurred as we moved from peak global QE to global QT over the past 2 years. With markets faring well into the end of the week, there’s still one more test with today’s payrolls report in the US due up. The market consensus is for a 200k reading following that softer-than-expected 134k last month. Our US economists expect a 185k print, but believe that risks are to the downside due to the hurricane disruptions. Our colleagues expect the unemployment rate to remain steady at 3.7% (with risks it rounds down to 3.6%) while they expect average hourly earnings to rise +0.2% mom and to a new post-crisis high of 3.1% yoy - the highest since early 2009. This represents a jump of almost 40bps from the September reading which is largely due to base effects from October 2017, when earnings plunged after Hurricane Harvey, Irma and Maria boosted September 2017’s print. Staying with economics, our German economics yesterday downgraded their near-term growth forecasts in light of recent data and also published the first big DB 2019 Outlook piece. In it they revised down their third quarter GDP forecast from 0.4% for 0.0.%, and their 2019 projection to 1.3% from 1.7%. This partially reflects the disruptions from new emissions standards, but it is also attributable to softer external demand as net exports drag on growth. On the political front, snap elections look more likely after Chancellor Merkel’s decision to not seek another term as party leader. The continuity replacement candidate would be Annegret Kramp-Karrenbauer, while a slightly more conservative and market-friendly option would be Friedrich Merz. Regardless, the SPD will reconsider its membership in the grand coalition and snap elections could come sooner than many currently expect. Back to yesterday and European markets lagged behind the US with the STOXX 600 closing +0.41% and the DAX +0.18% - the former hindered by a struggling energy sector after oil tumbled around -2.5% following the latest supply numbers from OPEC which showed crude production had climbed to the highest level since 2016. European Banks did, however, finish up +1.47% - the third >1% rise for the index in the last six sessions – while bonds were slightly weaker at the margin (Bunds +1.4bps) with the exception of BTPs which ended -4.8bps lower in yield. Treasury yields turned lower after the ISM manufacturing print which declined 2.1pts from September to a below market 57.7 (vs. 59.0 expected). New orders tumbled 4.4pts to 57.4 and employment 2pts to 56.8. While these headline moves looked a lot softer than expected its worth putting the overall level in the context of what is still a number firmly in growth territory. Plus, the prices paid subindex rose to 71.6 versus the expected 69.0. It’s therefore unlikely to deter the Fed from the current path with respect to the growth outlook. Here in the UK, we had the double act of a BoE meeting and more Brexit headlines. Gilt yields faded from early highs to close just +1.8bps higher, however Sterling rallied +1.93% for its biggest gain since April 2017 and in the process edged above $1.300 again after trading as low as 1.2696 just three days ago. The BoE meeting wasn’t much of game changer with policy left unchanged as expected, but with minor tweaks to the Inflation Report (mostly in line with our expectations) tilting the outlook slightly towards the hawkish side. As for Brexit, well the Times “financial services deal” article that was out early yesterday morning was quickly downplayed from all sides, however a more material story was the MNI article which said that the EU is moving toward a semi-temporary customs union arrangement for the whole of the UK. Such a setup would apparently include strong regulatory alignment and would have no fixed end-date. This would likely be sufficient to prevent the imposition of border checks in Northern Ireland (between NI and either Ireland or the rest of the UK), which should keep the DUP onside. We have long viewed this outcome as the most likely, though it is likely to enrage the hard Brexit wing of the Conservative government, potentially raising the odds of a political crisis if the story is confirmed. Later in the session, the FT reported a similar story about the proposed deal, and the pound held its gains. The chatter of late points to a deal being in sight but then the domestic political fun and games will start.